WHAT: Book Signing for "My Days with Nell"
I am pleased to announce "William and Grace"will be the venue for my Asheville Book Signing. They are a family owned boutique located in Historic Biltmore Village in beautiful Asheville, North Carolina. I have known Brenda and Thea for over five years and I am honored they accepted my request to do our signing at their lovely boutique. Please plan to come by and visit with us the first Saturday of October.... I would love to meet you and share my book! You will love browsing all the wonderful clothes, gifts and toys offered at "William and Grace." Hope to see you there! I'm very appreciative to the sweet folks at McDowell County Public Library! They have graciously agreed to host a book signing for me. Virginia "Ginny" Palmer, the illustrator for "My Days with Nell" will join me on Tuesday, September 24, 2013, from 3:00 to 5:30 pm in the conference room of the library. I met with Elizabeth House and the staff at the library yesterday and couldn't be more impressed with their professionalism and generosity toward this endeavor. So excited! Western North Carolina writer Victoria S. Blake had always dreamed of writing a children's book, having worked more than 20 years as an elementary school office administrator. While accompanying a group of grade school children on a field trip to the Biltmore Estate, she was inspired to pen a story about Cornelia Vanderbilt and her best friend. 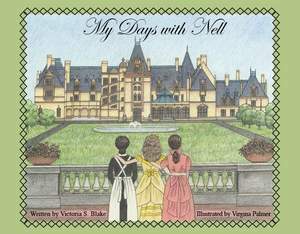 "My Days with Nell" is a heartwarming story of life in the early 1900s in America's largest privately owned home, the Biltmore House. Illustrations by Virginia Palmer bring to life the main character, Lilly Staton. In the story, Lilly and her parents travel to the foothills of the Blue Ridge Mountains to receive treatment for Lilly, who has tuberculosis. Cornelia Vanderbilt, the only child of George and Edith Vanderbilt, befriends Lilly.The two friends are soon joined by Ellen Jorith, an African-American child, also recovering from tuberculosis. "My Days with Nell" portrays the Vanderbilts as compassionate, caring people and faithful friends. www.mydayswithnell.blogspot.com or call 828-277-0998 for more information. 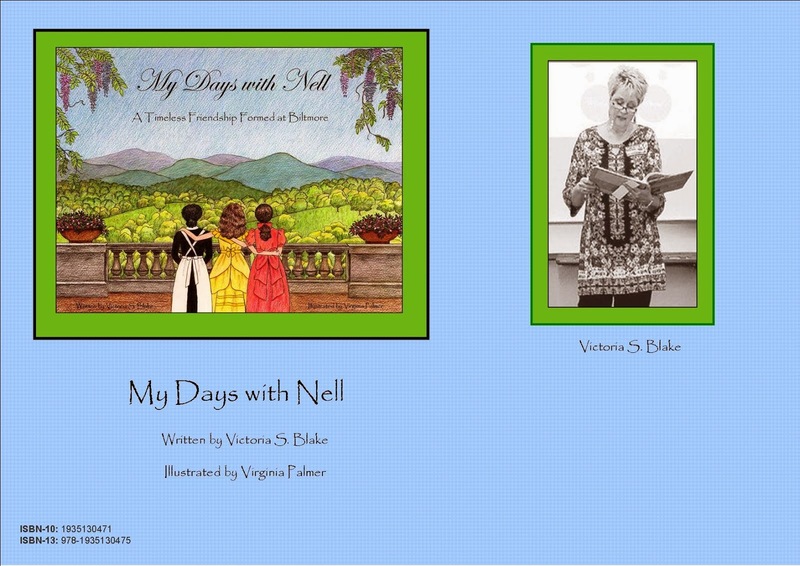 ASHEVILLE – Grateful Steps Publishing House announces the arrival of the new children’s book, “My Days with Nell” by Western North Carolina writer Victoria S. Blake. A story about Cornelia Vanderbilt and her best friend, “Nell” is set at and around the Biltmore Estate in the early 1900s. Illustrations by Virginia Palmer bring to life the main character, Lilly Staton. Lilly and her parents travel to Asheville to receive treatment for Lilly, who has tuberculosis. Cornelia, the only child of George and Edith Vanderbilt, befriends the girl. The two friends are soon joined by Ellen Jorith, an African-American child. Biltmore Estate has given permission for its trademark front view of the Biltmore House to appear on just the first 500 books printed. To learn more, including where the book is sold, call Grateful Steps at 277-0998. I hope to have a couple book signings in September or October and have been asked to be a part of the author's booth at the Mountain Glory Festival for MACA. I'm so excited! My book has arrived! I'm so grateful to Micki Cabaniss Eutsler at Grateful Steps Foundation, LLC for her guidance through this entire process. Can't wait to share it with my family and friends.